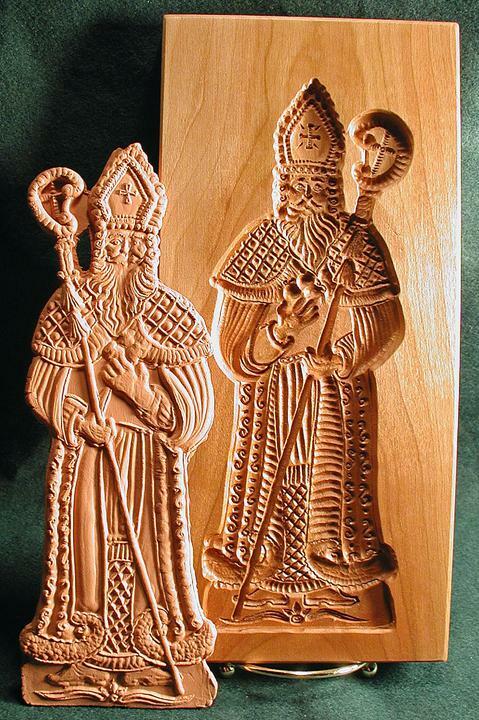 Gene Wilson is known as America's Woodcarver of Cookie and Butter Molds. In the 70's, Gene and June Wilson discovered wooden mold collections in US and European museums. 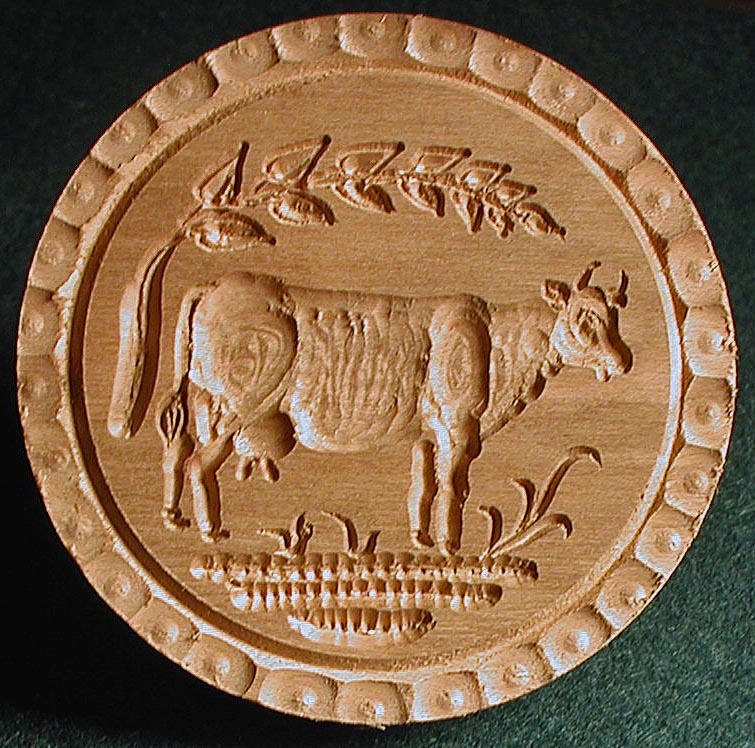 Gene was smitten with the reverse carving - and soon turned his artistic talents to designing and carving wooden cookie molds. He joined the Midwest Woodcarvers [Belleville Holzschnitzers] Club and began marketing his carvings. June has helped test cookie recipes and process orders. Gene has worked to perfect his technique of power tool engraving with a hand-held router. This innovative, self-taught type of freehand carving has allowed a vast variety of molds to be offered at affordable prices. Since no carving templates are used, each mold is an original carving with it's own "personality." Allen Buchheit is Gene's nephew and apprentice. 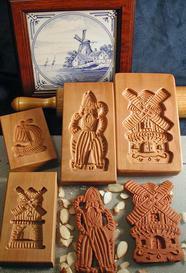 Allen will attempt to carry on this traditional carving of cookie stamps and molds for years to come. 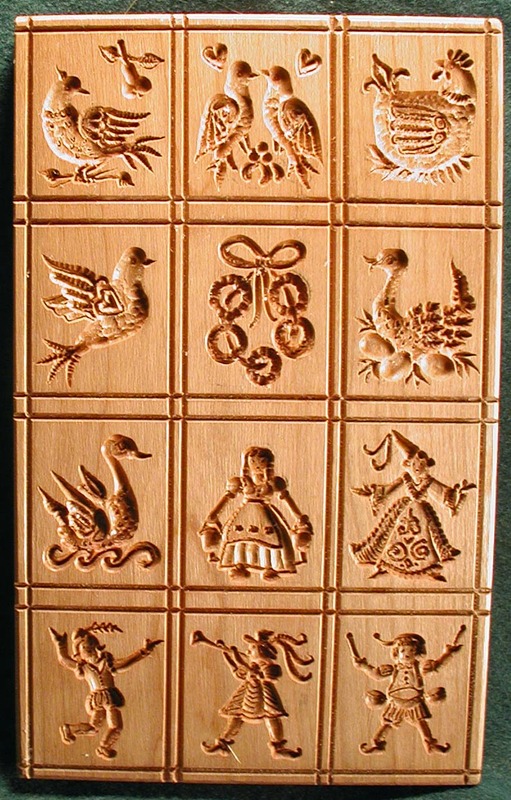 Over 100 designs of hand carved cookie molds are offered by mail order: springerle presses (molds), cookie stamps, deeply carved wooden cookie molds for shaping holiday picture cookies of German springerle ("springers") with or without anise. All molds are solid hardwood and ever so slightly different due being individually carved. 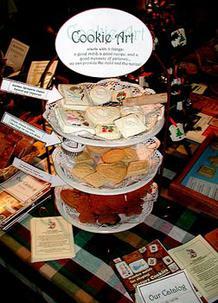 is that rare source of butter stamps, and gingerbread hornbook molds. Gene also handcrafts ABC hornbook replicas and has written some simple horn book histories. 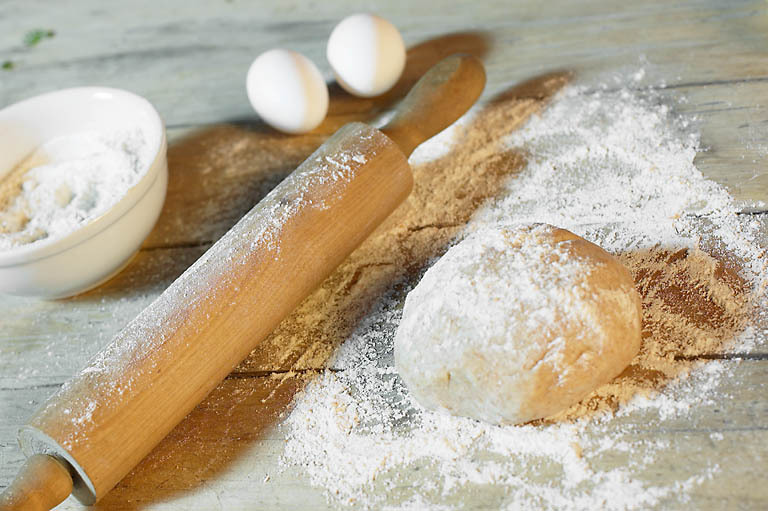 Our solid, hardwood cookie molds are carved with hand-held power and hand tools - without the use of any carving templates or duplicatiing machinery. Farrell Eugene Wilson was born in Olney, Illinois where his parents ran Wilson Dairy Farm. an older cousin, Bob Henry, killed in WWII. Near the end of WWII, his mother remarried a farmer and major adjustments were required as Gene attended a one room school for three years. Farm life required Gene to develop a better knowledge of tools and gave him some valuable "hands on" mechanical experience. His participation in sports, and his work in Scouts, 4-H, and church youth groups helped him to develop some leadership experience that would better prepare him for a teaching career. His high school classes (which included one year of shop and two years of art) were definitely not college preparatory! Planning on a career in printing Gene worked part-time in the print shop of a daily newspaper during his junior and senior years. "Morning farm chores, to work at the newspaper by 7 a.m., to school by 11 and home for chores by 4:30 p.m. was typical during those two years," he explains. Thus it was that he became accustomed to a busy schedule. Upon graduation, he accepted a teaching scholarship and enrolled at SIU-C. Considering a major in art, he soon chose biology instead - as it left open an option to consider pre-med. Nearing graduation, he accepted a job teaching junior and senior high science. He and June, an elementary teacher, were married that same year. After three years of teaching, he received another scholarship and earned his Master's Degree in biology from Arizona State University. In the following decade, the Wilson family of four (one son, one daughter) settled in Belleville and spent a number of summers away from home as Gene enrolled in various graduate courses. Gene was a full-time biology professor with Belleville Area College until his retirement in 1990. He continued to teach some courses, part-time, until 1994. Gene is a member of the Belleville's Midwest Woodcarvers Club which sponsors the huge Woodcarving Art Show at the Belle-Clair Exposition Hall the first weekend in November. The Wilsons have exhibited and sold their carvings at this show for over 40 years. Wood Carving Illustrated, "Edible Art" by Mark Weinstein, Holiday 2004, Pp. 44-47. Taste of Home, "His Carved Molds Shape Unique Christmas Treats"
St. Louis Post Dispatch (Food Section), "Retired Professor Carves Out A New Career" by Cleora Hughes, June 26, 2000. Naples Daily News (Food Section), "Cookies Fit For Molding (Tested Recipes) by Cleora Hughes, September 13, 2000. Early American Homes Christmas Book, "Irresistible Specialty Items"
Pp. 49, 66; Christmas 2000. Q # 1. What are cookie molds and how are they carved? Cookie molds are "dough shapers" used to produce fancy figure picture cookies. Today, reasonably priced wooden molds for shaping cookie dough are difficult to find. needed to fill hundreds of orders received each year. "Carving wooden cookie molds is a dying European art," Gene explains, "an art that June and I are trying to keep alive." Ironically, orders for molds have been received from Europe. The Wilsons' last trips to Europe proved to be disappointing in regard to both the availability and quality of wooden molds. They feel that it is especially sad to see the art of carving and using traditional molds decline in the countries of their origin. Q. # 2. What was Gene's Inspiration to Carve Molds? 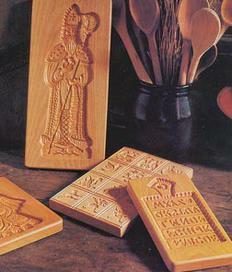 began carving cookie mold plaques in 1972.
few "secrets" that allow molds to more easily release the dough castings. searching for new ways to market unique cookie presses to bakers, collectors, and home decorators. The developing craft market of the early 70's allowed Gene to carve out a niche for his new products. 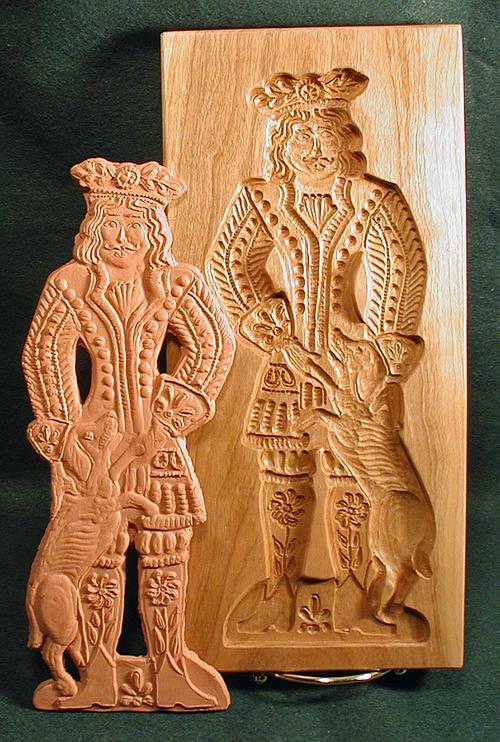 Today, his carvings are sought after as he is (to our knowlege) one of only three woodcarvers in the U. S. to produce a variety of handcarved molds for sale to the general public. Gene now carves over 1000 cookie stamps and molds per year. Carving on the backside of the mold, he initials and dates each piece - a practice much appreciated by cookie mold collectors and antique dealers. Q. # 3 How are Gene's Molds Similar to Antique Wooden Molds? springerle presses, rollng pins, and several modern European molds. Tiroler Volkkunstmuseum (Tirolean Handicrafts Museum). (3) Paul E Kindig's illustrated Butter Prints and Molds, 248 pages, Schiffer Publishing, 1986. Q. # 4. Why Use a Router to Carve Such Small Details? type of carving despite the fact that the best known woodcarver in the U. S.
said that such a power tool could not be used for detailed carving of such molds. carving was done with a full size, seven pound router! greater speed and therefore market original carvings at very reasonable prices. Q. # 5. How Long Does It Take to Carve a Mold? allow Gene to work faster than most carvers. used, each carving develops - as Gene likes to say - "its own personality." Q. # 6. Does Carving the Same Designs Repeatedly Make it Easier? Gene explains, "The longer that I carve the same design, the more detail I seem to add-- so, yes, it gets easier but it also gets better! "Customers who have collected my work over decades have noted that as I have increased the quantity of the molds I carve, the quality remains. Sadly, this is the exception to the rule for most production artists and craftsmen." Q. # 7. Are The Designs Old or New? Gene feels that the greatest challenge in carving is the designing of new wooden molds. Not every appealing design is suitable for a cookie stamp or mold. To ensure that the cookies bake evenly, the mold should be of a fairly uniform depth. It also must be of a fairly compact shape so that the cookie will release from the mold without breaking. Gene has carved over 200 different designs and has dozens of designs in his "idea file" that have never been carved. A type of craft clay called 'super sculpey' is used as an aid in evaluating the details of a new mold design carved for the first time. Gene uses the clay for test impressions and makes adjustments in the depth and detail fo the carving process as he goes along. "After testing," he admits, "you sometimes have to re-work a design -- seems that you're always refining what you do." A comparion of the molds he carves today with those he carved in the early '70s shows that a lot of refinement has occurred over the past decades. Obvious are improvements in the depth and detail of carving, in the finish, and in the wood quality. He now sands the wood smoother and slightly sands the edges of many molds to give them a softer and more finished look. Gene observes that customers are more selective in what they purchase for gifts or to hang on their walls than in the early '70s. In general, "cute" is OUT, "unique" and "functional" are IN. Customers prefer a carving which is FUNCTIONAL even if it is purchased as a decorative accent and will never touch food! Antique molds serve as a pattern for some of his work, but most of his designs are original. Original designs include most of his angels and santas, his Christmas springerle presses and ornaments, the Victorian springerle press, his Dutch and Alpine boys and girls, and many of the cookie stamp designs. "I enjoy new patterns and most of the time," Gene says, "what I like the best is what I've most recently carved for the first time." Q. # 8. What Woods and Finishes are Used - and Why? (resistance to marring) for producing heirloom molds and a resistance to being "burned" by router carving. wood a reddish brown finish that deepens in color and character with age. A very few of Gene's customers order molds in raw wood (finish "A") because that is the way most of the European molds are sold. 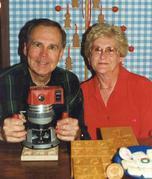 Gene and June find such molds difficult to use and strongly recommend the "B" finish for molds that are ready to use. Since the Wilsons use two kinds of hardwoods they can not guarantee that two molds will have a perfectly matched finish. Even if of the same species, no two pieces of wood are exactly the same in grain, density, and finished appearance. with a note that matching is very important. Q. # 9. What Different Types of Wooden Molds does Gene Carve? Cookie Stamps are carved in the greatest number - and are the easiest of the molds to use! Springerle Presses are carved in large quantities. These molds have quaint designs that are pressed on dough of uniform thickness to make embossed picture-cookies. Deep Cavity Molds are carved in smaller quantities. 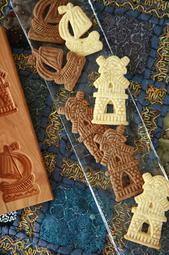 These molds are used to create cookie-art figures of European gingerbread, Dutch speculaas or Scottish shortbread. Q. # 10. Why is Shaping Cookies with Wooden Molds a Tradition Worth Saving? 1. Molded picture cookies are a genuine art form, rich in cultural heritage. 2. Picture cookies have such festive and intricate designs that your adult guests often "taste"
such works of edible-art ONLY WITH THEIR EYES. only with their eyes! create family heirloom Christmas tree ornaments. and showing them how to make picture cookies! 5. Having just the subtle evidence of having been used, the mold actually increases in aging and value. Q. # 11. Are Recipes and Instructions Included? impressions are a perfect reflection of the mold. Q. # 12. Are There Other Uses for these Wooden Molds? Wooden molds have long been used for shaping things other than cookie dough such as butter, cream cheese, chocolate, clay, and wax. Recent craft ideas have included being used to create paper castings, salt dough ornaments, cinnamon ornaments, etc. + Small business, no employees. Carving, web design, marketing and shipping by the owner. + At present, no wholesale of molds - nor carving of designs submitted by customers. + Sales limited to www.cookiemold.com and to the annual Belleville Woodcarvers Art Show the first full weekend in November..
+ Molds of premium quality cherry and beech hardwoods, typically with a food-safe finish. a dozen recipes are included in this website for easy downloading! Gene. 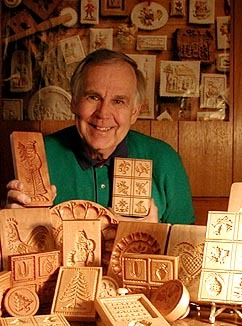 age 84, has been an active member of Belleville Holzschnitzers and has displayed [and sold] his cookie mold carvings at the annual Belleville Art Show for over 40 years. He continues to carve an average of 20+ hours per week. He has always hoped [and now found] a family member desiring to continue his unique carving style. His nephew Allen is, under his guidance, is developing those skills. Your support of Allen's efforts will allow HOBI Cookie Molds to continue to offer customers a variety of reasonably priced original carvings.